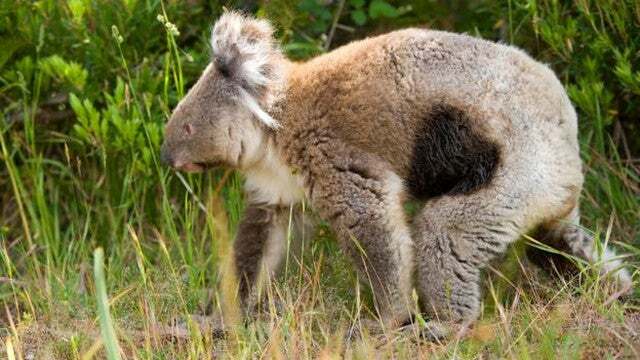 Australia’s iconic koala — a species already threatened with extinction — is currently in the midst of a devastating chlamydia epidemic. Some scientists are now arguing that in order to save these cute marsupials from extinction, we may have to euthanise them in a massive cull. Chlamydia is an ancient sexually transmitted disease that affects more than just human populations. As the BBC reports, the bacteria, which appears in many mammals, birds, and reptiles, is currently causing havoc among Australia’s koalas. Estimates suggest that about half of all koalas on the continent are infected, and in closed populations, that figure could be as high as 80 per cent. Given its rate of spread, and considering how painful and debilitating the condition is for koalas, some conservationists are calling for a massive cull in order to get the disease under control as researchers feverishly work on a vaccine. Koalas are struck by a different strain of the disease from that which affects humans – although it seems humans can catch the koala version through exposure to an infected animal’s urine. In koalas, the effects of chlamydia are devastating, including blindness, infertility and an infection known as ‘dirty tail’. This in a species already under terrible pressure. Koala populations have dropped 40 per cent in Queensland and 33 per cent in New South Wales since 1996. Koalas were formally added to the list of threatened species in 2012. Unfortunately, antibiotics won’t help. These drugs would actually destroy the complex microbiota that exists in the stomachs of koalas — critical microbes that allow them to digest their sole food source, eucalyptus leaves. Paradoxically, we propose that euthanizing more koalas could help to increase koala population numbers. We investigated the potential impact of systematically euthanizing diseased koalas. Using data from a well-studied koala population, and an individual-based computer simulation model, we predict that such a program would result in a larger population of koalas after 7 yr than would exist without the program. If terminally diseased and sterile koalas are euthanized and other infected captured koalas are given antibiotics, chlamydial infection could be eliminated and population growth observed after 4 yr. The practical implementation of such a program would be facilitated with further development of tools to diagnose infection and internal disease in the field. It’s a classic case of addition by subtraction. As radical as this plan sounds, similar strategies have been employed for Tasmanian Devils who are currently grappling with a transmissible form of cancer. These culls haven’t been very effective, but Wilson claims they’re not being managed properly.